Boann Distillery and Boyne Brewhouse are located just off the M1 near Drogheda in Co Meath. Opening early 2016, the brand new €20 million facility includes a whiskey and gin distillery, a craft brewery and taproom. It also has a visitor centre with a 120-seater restaurant, and guided tours are available. Beer production is already underway in the 50,000sq ft building, with gin and whiskey production to follow. The project is to bring approximately 80 jobs to the area. Internationally renowned master distiller, John McDougall, is consultant distiller to the project and will be working closely with Áine O’ Hora, head distiller and brewer. 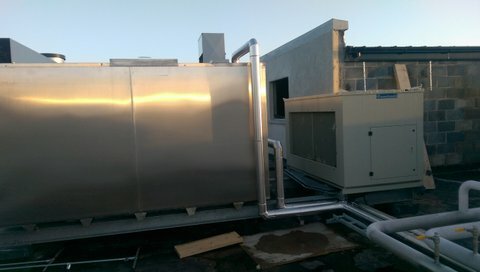 Here at Kilkenny Cooling Systems we are delighted that at the heart of this state of the art facility is a brand new Kilkenny IB-05-1250 ice water based process cooling system. This mid-sized ice builder is a centrally-located process cooling system which supplies chilled water to the various brewing and distillation processes throughout the building. Our range of ice builders comprise an extremely versatile cooling solution for any production facility which requires a centralised process cooling system such as (in this case) a brewery and distillery, but they are also suitable for food manufacturing facilities or for cooling industrial plant or controlled environments such as marine tanks for fish farming. Drogheda was once home to eighteen local distilleries. Like many Irish towns and cities, this number dwindled over time. In 1822, there was just one left. Before Boann, there hadn’t been a distillery in Drogheda for 50 years. Thankfully in recent times there has been a great resurgence in Irish craft beer and Irish whiskey with local brands appearing towns and villages all over the country. Many of these new facilities are equipped with Kilkenny process cooling systems – tapping into our many years’ experience in designing and manufacturing process coolers and equipment for the brewing industry.